When attracting visitors and potential clients, you need to think about your target market’s needs on a focused and detailed level. 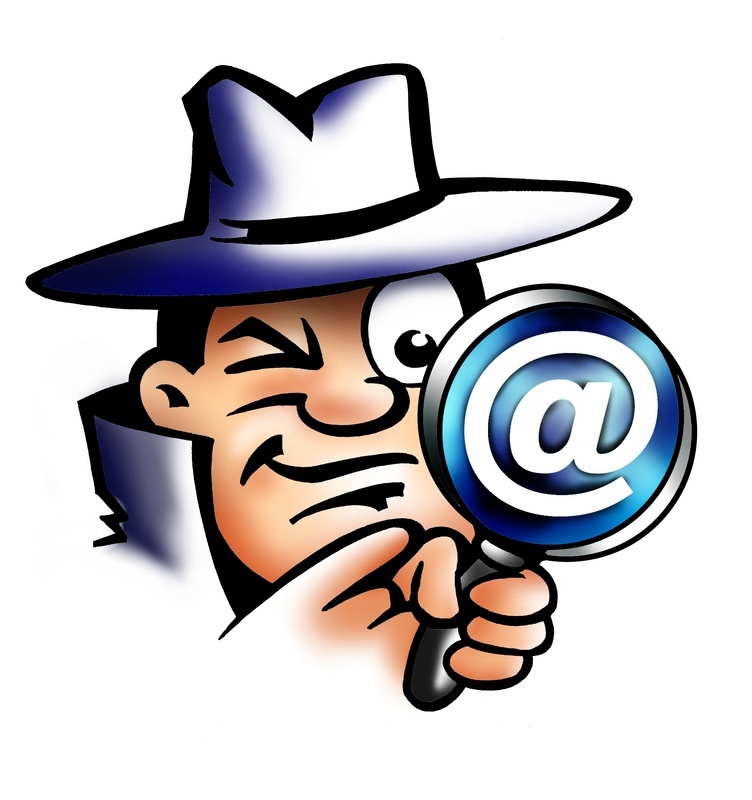 The main purpose is to ensure that each segment will receive its own targeted campaign . Many websites reach global communities with the same offers and promotions, but if you wish to narrow down your campaigns it is really important to modify your strategy between Canadians and Americans, for example, or between users coming from LinkedIn and those coming from Facebook. 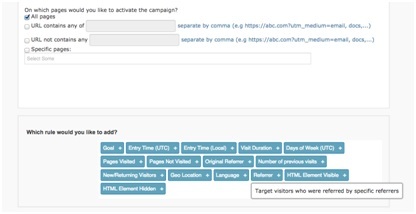 In step 2 of your campaign creation — targeting rules — you can add the “referrer” option from the many choices that appear. For the purpose of this tutorial we have selected that this campaign will appear on all pages. When you hover over the “referrer” with your mouse, you can see that it targets visitors from other referrers, meaning other websites. When you click on the “referrer” a box with several options will appear. Suppose that you have Canadian, as well as American or European clients. You have a campaign that won’t apply to Canadians using Google.ca, but will appeal to the Google.com users. 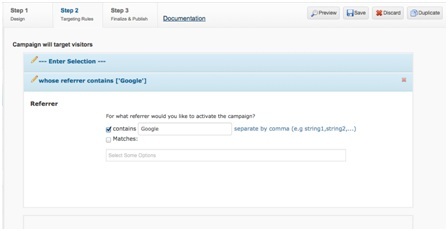 You can specify in the matches section that only users that come to your site from Google.com will see your campaign. You can change it to any URL that best suits your needs. You can even use “Facebook.com” for only Facebook users. You can also add as many as you choose but remember that this option is for exact domain. In the list you will see list of exact referrers that have already brought traffic to your website. If you prefer not to limit your campaign to exact domains, you can choose keywords that referring websites will contain. 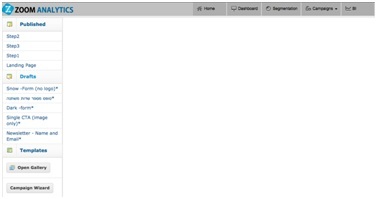 Mark the ‘Contains’ checkbox and fill the string to look for in the referring domain. Once you have chosen your referrer specifications, you can preview the campaign before publishing. 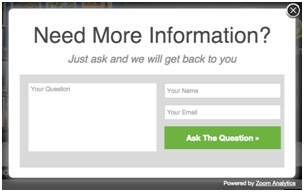 In our example, this lead-generation pop-up will appear based on our rules. If you find yourself having to log-out of your campaign for a few hours before you publish, you can easily find it again by looking under the “Drafts” section on the left-side. All work-in-progress campaigns appear in this list. Just choose the campaign and continue editing it. When analyzing a goal it is important to understand the conversion rate of specific visitor segments or cohorts. 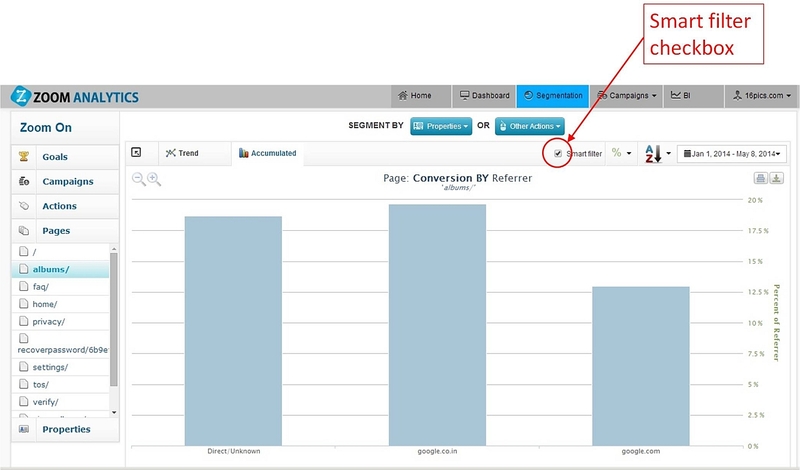 For example: 14% of visitors who were referred by ‘Bing’ achieved goal ‘signup’. This means that ‘Bing’ has conversion rate of 14%. If you look just at the absolute number of visitors you might be missing important information: ‘Google’ may be driving x5 more traffic than ‘Bing’ but with lower conversion rate. Back to Segmentation: first you choose the dimension you want to analyze (e.g. geo-location, time-of-day, referrer, etc. ), and then look at the conversion rate of the sub-segments. There might be many sub-segments in some cases (for example countries) so you should remove cohorts that are too small. The ‘smart-filter’ will do that for you when you enable it for a specific graph. The following short tutorial video demonstrates how to segment a goal by geo-location and find statistically meaningful countries.